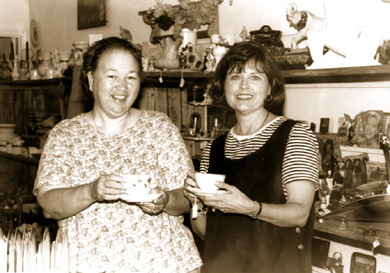 Lou Souders, right, talks with Kathy DuLaney of Our Place on Main about her business, Teacup Traditions. When Lou Souders says the miracle of it is that she had an idea and did something with it, she becomes an instant Our Place heroine. It's the founding concept for the Our Place initiative, and we know it's a continuing process. Lou's business success story is an inspiration for us and demonstrates yet another McCormick connected asset. Lou, a McCormick native, is the daughter of Helen and Jim Neal Workman of Augusta Street Extension. Lou now lives in Marietta but frequently returns to McCormick. When here she shops Main Street looking for teacups to use in her own business. Anyone who has a birth certificate listing McCormick as their place of birth was most likely delivered by Lou's grandfather, Dr. Workman. Now Lou is delivering awesome bundles of joy with her home-based business, Teacup Traditions. She starts with a vintage teacup and adds letters she has written for one person to give to another. She calls these messages her "Stories." The first story she wrote was for her daughter, Helen, who is now the mother of two children of her own. Once when Helen was a teen and needed to see that her potential was obvious to others and that God had a purpose for her life, Lou encouraged her by giving her a teacup with a loving letter she had written. Helen has kept the teacup on her dresser all these years. Based on the same idea, Lou later gave teacups as wedding gifts with a letter showing how marriage is like a cup and saucer, made separately but united in purpose. From these first ideas she now has story versions of the letter for a friend, bride, bride's maid, baby, mother, grandmother, granddaughter, sister, wife, teacher, and more. She has even expanded from teacups into linens, tea towels, hankies and even aprons. Each gift comes with a special message for a special person to say I love you: I care. Lou's Teacup Traditions are carried in gift shops in 10 states and the business is steadily growing. Southern Lady Magazine and the Marietta Daily Journal have done articles about the success of her business. This View is a summary of what they wrote about Teacup Traditions. Reaching out is what her business, as well as the store we call Our Place, is really all about.